Travel is one of the industries which assimilates perfectly with all things digital. 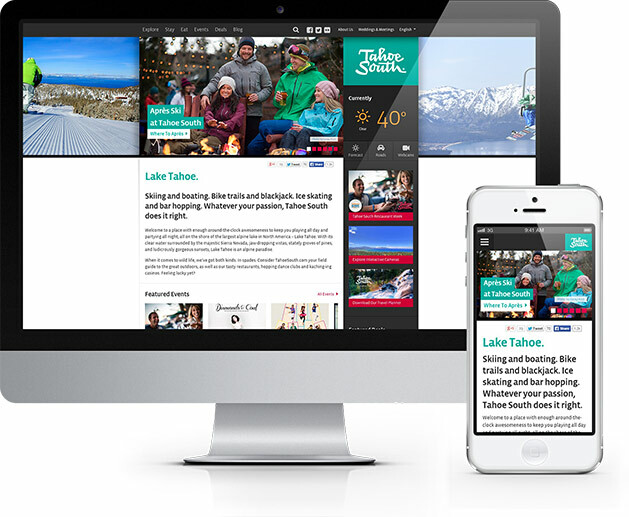 The Lake Tahoe Visitors Authority began taking a fresh look at its digital strategy, recognizing the need for an improved tourist-centric digital presence which effectively reaches tech-savvy travelers on the go. Noble Studios collaborated with Duncan Channon to rebrand the Lake Tahoe Visitors Authority. The agencies went through a lengthy discovery process to architect, program and launch a website and mobile experience for the region’s visitor authority. The site celebrates the new brand, Tahoe South, as a travel destination with four-star resorts, more than 600 vacation rentals, outdoor recreation, gaming, beachside dining and 24/7 nightlife. Extensive research was conducted to identify the destination’s brand guidelines, voice and passion segments and reach new and repeat visitors through strategic content development. To capture and truly understand the entire tourism experience and its impact, the agency teams regularly visit Tahoe South and evaluate its web analytics to continuously optimize the user experience. Noble Studios developed Tahoe South’s website and mobile site with visitors in mind. The website features an event module, deals page, blog and real-time social feeds. The greatest advantage for mobile users and travelers on the go is location-based results. Visitors to Tahoe South can find what they want based on what is nearest to them at the time of use. Visitors can also view road conditions, make reservations, buy show tickets, and of course, snag the best deals in Tahoe South at the tap of a finger. They can plan their day by clicking on events to see what’s happening now. Both experiences are visually stimulating and designed for quick navigation. Like the website, the mobile site celebrates Tahoe South as a year-round travel destination and outdoor mecca. The real-time weather display changes color as the temperature fluctuates at Tahoe. Users can pan and zoom in on live scenes and see archived webcam images. Website tracking has allowed Tahoe South to present greater value to stakeholders. Comparing the 2012-2013 fiscal year (FY) against 2013-2014 FY, traffic to the mobile site is up 134% and page views are up 102%. The mobile site also received a 345% increase in organic search and 224% increase in referrals from social media. Traffic to the desktop site is up 14% and page views are up 32%. The desktop version also received a 38% increase in organic search and a 32% decrease in the bounce rate. In addition, the site redirected more than 100,000 referrals to partner sites between September 2013 and June 30, 2014. Learn more about how we create even better practices for digital marketing in travel and tourism.